Last week Bo had another great trip to the Miramichi River in New Brunswick, Canada. 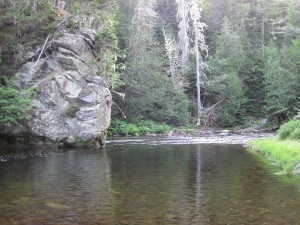 This river is considered “Holy Water” by Atlantic Salmon fly fishermen. The more you learn about these wonderful fish the more you appreciate how special they really are. After three years in the ocean they start moving back up the river in May to spawn in late September, or early October. They remain in the river all winter under the ice to care for their young and all the while they basically do not eat and may loose forty percent of their body weight during this time in the river. This is why they are so difficult to catch on a fly. They are not feeding when they take a fly they are merely reacting to something, which does not even attempt to imitate food, that has invaded their territory. As the ice melts in the spring the Salmon follow it back out to sea while the offspring remain in the river for three years before making their journey to the Atlantic Ocean which is a trip that takes them all the way up to Iceland. They remain at sea for three years feeding and getting strong for their trip back home to the Miramichi River. Unlike the Pacific Salmon which die after their first spawning run, these Atlantic Salmon can return to the river and spawn multiple times in their lifetime. 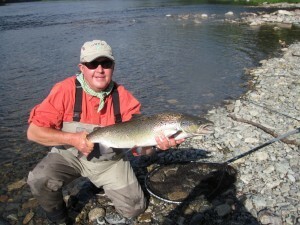 The Atlantic Salmon in the photo below was taken in the Sisters Pool on a Sage Xi2 9wt. fly rod, an Abel Super 8 reel with floating fly line, on Maxima 12 lbs. tippet and a #8 Black Fly. This fish measured thirty inches and was in the net, photographed and released within seven minutes. Special fish in a very special place! There are more photos of Bo’s Atlantic Salmon trip to the Miramichi River in the Gallery section of the website. I have got figure out how to get Bo to take his faithful Yellow Lab to Canada next year.